Introduction Recurrent laryngeal nerve injury caused by cardiovascular disease is a rare condition, and often it is the only prominent sign of an imminent break of an aortic artery aneurysm. 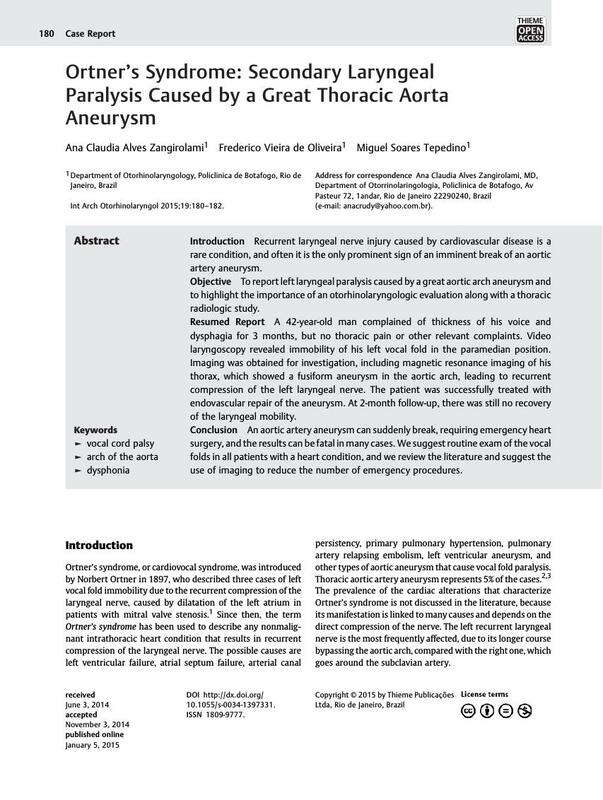 Objective To report left laryngeal paralysis caused by a great aortic arch aneurysm and to highlight the importance of an otorhinolaryngologic evaluation along with a thoracic radiologic study. Resumed Report A 42-year-old man complained of thickness of his voice and dysphagia for 3 months, but no thoracic pain or other relevant complaints. Video laryngoscopy revealed immobility of his left vocal fold in the paramedian position. Imaging was obtained for investigation, including magnetic resonance imaging of his thorax, which showed a fusiform aneurysm in the aortic arch, leading to recurrent compression of the left laryngeal nerve. The patient was successfully treated with endovascular repair of the aneurysm. At 2-month follow-up, there was still no recovery of the laryngeal mobility. Conclusion An aortic artery aneurysm can suddenly break, requiring emergency heart surgery, and the results can be fatal in many cases. We suggest routine exam of the vocal folds in all patients with a heart condition, and we review the literature and suggest the use of imaging to reduce the number of emergency procedures.